The first time I held a gun, my panicked friend chastised me for absentmindedly pointing the unloaded rifle at him. I felt sufficiently careless enough to make it a point not to touch a gun again. But Thursday, I was dispatched to the range to fire a gun to better understand and tackle the issue of gun safety. Certified instructor Mike Bain, owner of Defensive Specialties and a former law enforcement officer, gave me an abbreviated lesson. After explaining some safety guidelines — no live ammunition present — he had me shooting at a private gun range in Hall County. Picking up the gun, I was surprised by how heavy it was. But my 13 years of ballet made holding the gun up relatively easy, just like first position. Yoga practice came in handy, too, as nine rounds later, I was doing OK standing in what is basically warrior one position. But like my editors, Bain had corrections: Hold your breath. Focus your vision at the end of the scope. By round two, I corrected a high aim and hit the paper plate all nine times with various degrees of accuracy. It was small caliber and short distance, but “I had potential,” he said. 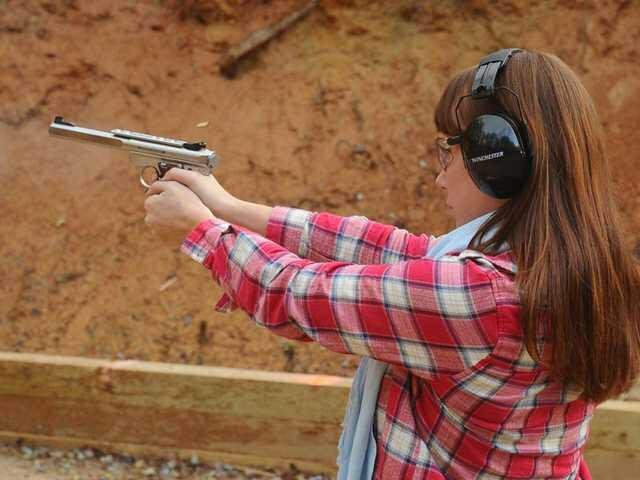 I’m still a long way from feeling comfortable enough to own a gun, but the adrenaline rush and sense of calm afterward was an unexpected delight. Most importantly, the safety tips, while simple, were a great comfort to know.